To reduce the amount of treatment you have in a lifetime it makes sense to choose the most durable repair option for teeth. Every repair has a lifespan so the earlier a longer lasting repair is chosen the less repairs that tooth will ever have. Especially a heavily filled tooth, when it fails generally it soon needs repair again and again eventually needing a more expensive crown. A Cerec inlay at the outset skips the intervening repair fillings saving time and money and actually avoids a full crown. This is borne out by the result of a report from a German Dental Insurance company that shows Cerec Dentists bill less on average so costing less. Twice the compressive strength of enamel. Actually increases strength of tooth unlike conventional fillings. Roughly same wear rate of enamel so does not excessively wear opposing teeth unlike existing porcelain for Crowns. Similar coefficient of thermal expansion & contraction so does not stress tooth when heated or cooled like normal fillings, so leading to less cracks & breaks. 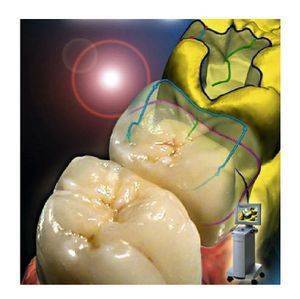 Reduced complications with a lower incidence of pain or root fillings after repair with Cerec than other materials. Does not corrode releasing potentially toxic substances such as mercury from amalgam & free monomers from composite fillings. Better life expectancy than previous best material, Gold (supported by independent studies). Similar cost and sometimes cheaper than conventional crowns as do not need the added cost of a crown core as standard crowns frequently require.